E-commerce payment gateways – what works best? When you’re setting up your e-commerce store, selecting the right payment gateway is critical. It impacts how much it costs you to do business, as well as how customers feel about buying from your online store. If it works well and instils trust, that in turn boosts your bottom line. There are many aspects to bear in mind when making your payment gateway selection. The checklists below will help you think these through in a logical fashion. 1. Do payment methods suit your customer base? It is important that the payment gateway you choose supports the payment methods your customers want and need. While the majority of South Africans still prefer to use a credit card to pay for goods and services online, it’s important to offer a wider choice. For more help with deciding on payment methods, see here. It also helps to know who your specific customers are. For example, older people tend to be more risk averse and prefer to stick to what they know, while Millennials are far more connected and open to innovative payment methods. Bear in mind too that many smaller customers, especially in South Africa, may not have access to credit or debit cards. So cash or alternative payment methods might work better if they are part of your customer base. 2. How do the costs of transacting stack up? Be sure to get exact figures for each one, and check whether these include or exclude VAT. See a list of Payment Gateway providers and their contact details in a table at the end of this post. The payment gateway will stipulate whether you need your own merchant account or if you can use theirs. Some of them provide packages tailored to both options. If you choose to use your own merchant account, then you have to contact one of the major banks and determine their fees. See their contact details below. You can ask the same questions about costs as above, except this time as they apply to the merchant bank account. Also check how long the funds take to reach your business bank account once the transactions have been authorised. To find out more about merchant accounts and why they are needed, see here. Check with your provider if there are any extra costs involved in integrating with a payment gateway. The plug-in may or may not be included in the cost of setting up your basic site. Once you know all the fees you can expect to pay, you can work these into your business model. To identify the best fee structure for your business, be sure to take into account your monthly transaction volumes and average cart value. Also check any contracts involved carefully and make sure the notice period is reasonable. That way there will be no hidden costs or other surprises further down the line. 3. Does your e-commerce platform support your gateway? Can they support your customers’ preferred payment methods? Which gateways do they support and can they provide for more than one? Will they integrate via an Application Programming Interface (API) and if so, is this integration ready for use or does it still needs to be developed? Do they offer a full site Secure Socket Layer (SSL) certificate? Are they Payment Card Industry Data Security Standard (PCI DSS) compliant and at what level? This ensures payment information is stored independently and protected by third parties. Do they use 3D Secure? This requires a single-use code from the customer to authorise the transaction. What fraud prevention and detection measures do they offer? For more on payment security, see here. 5. Does the payment gateway provide a good purchasing experience on your website? How much you reassure them along the way about the security of their sensitive information. This article will explain more about the issues you need to consider when creating the payment experience process for your customer. Ask your e-commerce provider as well as potential payment gateway providers for demos of the check-out process. This will help you understand more about how your customer will experience it. What is their response time? Are they genuinely helpful, and do they actually solve problems? Would you be contacting a call centre or getting face-to-face service from a personal account manager? Do they treat their merchants well? For the best feedback, try speaking directly to other merchants who are using their services, rather than searching for comments online. Are they well known and trusted? Payment processing is too important to take a chance on a fly-by-night operator. Have they had any security breaches recently? Also bear in mind that some issues that crop up may need support from your website provider, rather than from the payment gateway. Try to get as clear as possible on who is responsible for what. Understanding how the payment process works will help. In South Africa, all our local payment gateways are set up to transact in Rands. If you are using a different base currency on your site, for example US Dollars, or planning to expand globally at a later stage, this may be a problem. It may be difficult to get funds paid into your South African bank account. International payment gateway fees are often higher and you will also be paying for currency conversion. Payments can take much longer to clear, sometimes up to 21 days (whereas local ones usually clear within 48 hours). If there is a chance foreign currency may become a factor in your business, check upfront on how both your web development company and the payment gateways you are considering would handle it. It is very possible – but the options are more limited. Monthly transaction volumes per payment method for your business. Average order size (if applicable per payment method) for your business. Payment methods you are offering or want to offer. Use factor number 2 above to gather generic fees for a selection of payment gateway providers. You may feel to narrow the list of payment gateway providers down at this stage already using a quick overview of payment methods they offer, or using the factors above or by speaking to other merchants. The same for merchant bank account fees. Build a comprehensive spreadsheet where you compare all the payment gateways’ packages. Be specific to include the fees for all your desired payment methods. Note: only a few data points have been used in this example to try and illustrate it as simple as possible. For instance, the 3.9% used for the Aggregator’s merchant is only for credit cards and your average % may be much lower if your customers use a mix of credit cards, instant EFT and mobicred. Also, depending on your business you may be able to negotiate very different rates to another business. As a general rule: larger merchants may save money by having their own merchant account, and new businesses can save time and money by going with a payment gateway’s aggregated merchant account. However, we know of very large online retailers who are using aggregated merchant accounts – so best to do your numbers yourself. Once you have done the spreadsheet above in detail you will not only know whether you need a merchant account or not, but you will have a shortlist of payment gateways that may suit your business. It is best to check your spreadsheet again to ensure you cover all your payment methods. For example, some payment gateways may include options such as PayPal or Zapper in their fees, while with others you may need to pay extra if you want to offer that service. Use this step to build your spreadsheet in more detail on your chosen short list. Add all other ad hoc fees mentioned in this document that may not have been used in your comparison. Consider each option on your shortlist against the remaining factors we have discussed in this article above. For example, what kind of security and support do they offer? How good is their reputation? Can you stick with them if you expand internationally? Once you’ve followed the above process, you should have a clear winner. You could also ask your website provider to refer you to merchants with a similar business model. They should be able to give you personal insight into how their solutions are working for them, which will give you further data to add into your own decision-making process. The payment process is such a critical part of your business that you can’t afford to take a hit-and-miss approach. Following a methodical process to narrow down your options will help you identify the best one available, both to save you money and to keep your customers happy. 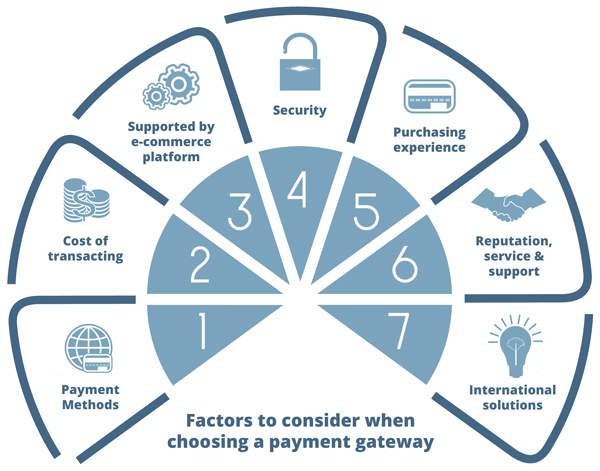 If you’re already using a payment gateway, how did you decide which one would be best for your business? And is it still working for you? If in doubt, contact us to help you determine the best way forward. Your consultation is free of charge.